Well, hello there! It feels good to be back after dedicating August and September to creating projects for a new quilling book. Finally, a bazillion photos, how-tos, and the actual projects were sent off to the publisher - yahoo! The next morning I was on my way to California where my eyes enjoyed a nice break by gazing at mountains and the sea instead of tiny rolls of paper. Special paper-y things interjected themselves into the trip though, and I'll be sharing them on Instagram (@allthingspaper) in the coming days. While writing a chapter about quilling tools, I realized it's been ages since I last discussed them in a blog post. I've always been a firm believer in using the most hand-friendly option, whether that means finger rolling, a needle tool or slotted tool. The decision varies from quiller to quiller and each person must make their own choice. My favorite might not be yours, yours might not be mine, and that is perfectly okay! I'll be focusing on slotted tool options in this post. 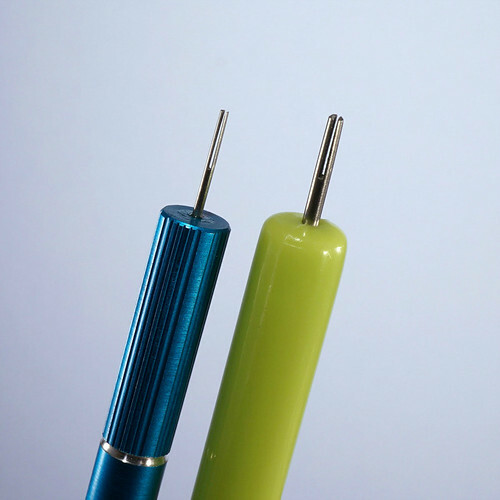 Most find the slotted tool to be incredibly easy to use compared to a needle tool because it grabs the end of a paper strip and holds it firmly while a coil is rolled. 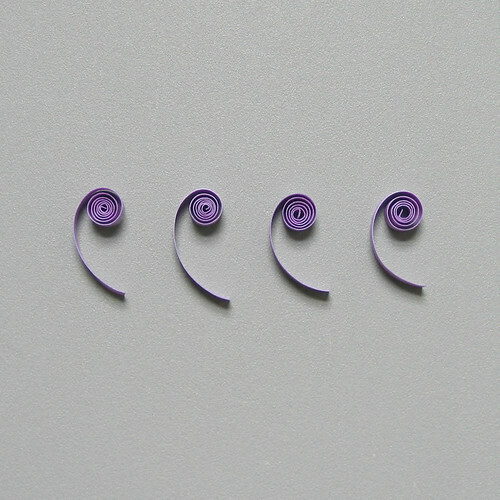 However, the tiny center crimp (1-2 mm) that the slot produces is generally frowned upon by quilling purists. The crimp can be lessened by making sure to slide the strip just barely into the slot and never so far as to bend it back on itself. To produce a coil without a crimp, one must finger roll or use a needle tool, corsage pin or any other slim, stiff wire substitute. As a former needle tool enthusiast, I'm happy to report the standard slotted tool has evolved in recent years and there are now a few types available that produce remarkably small crimps. That said, don't throw away your standard slotted tool as it is still useful when making folded roses and fringed flowers. My lime green tool came with the ever-popular Klutz book/kit Twirled Paper from Scholastic. This image shows four slotted tools, each with a representative coil. And below is a close up image of the four coils in the same order as above. I have been quilling with the Japanese super-fine tool sold by Stripe for nearly a decade. It produces a very tiny crimp. In all that time I have purchased only three, two of which are still fine. (I needed to have a spare on hand while doing wedding work.) The first one broke after several years of heavy use and a few unfortunate drops. The trick while using it and any fine-tip model, is to not push it past its limit. If your method is to roll a coil and then roll it even farther/tighter in order to snap off the crimp, you can expect a fine-tip tool to break. If you are not in Japan, I recommend placing an order by contacting Stripe owner/quiller Motoko (Maggie) Nakatani directly via email: info@e-bison.co.jp The cost is $24 plus $3 shipping. PayPal is accepted. You might enjoy my earlier post about being introduced to this Japanese quilling tool when I met Maggie in person. The ultra-fine tip slotted tool by Lake City, available from many online suppliers, produces the next smallest crimp, but not a perfectly round coil. It is the lowest priced fine slotted tool at about $4, and the wooden handle is comfortable to hold. I do wish the ultra-fine slotted needle was inserted farther into the wood as it would provide more leverage and the tip would be less likely to bend/break. 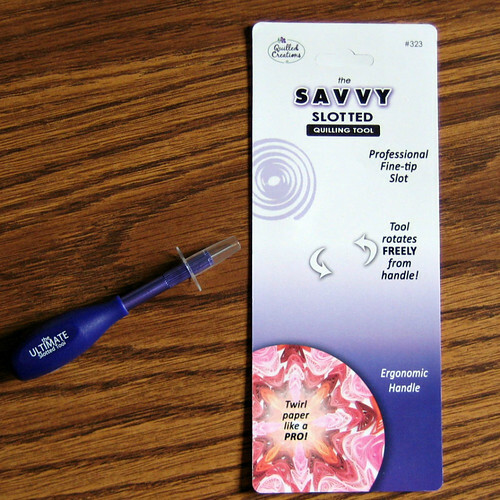 The Ultimate Savvy Slotted Tool from Quilled Creations (about $10) was released this past year. I was excited to order one thinking it would be just like my favorite Japanese tool. While the barrel looks very similar and the wide handle may prove to fit easily in your hand, the crimp it produces is not quite as small as the super-fine or ultra-fine tools, but the coil is round like the ones produced by the Japanese and standard tools. So which tool should a new quiller purchase? There is no easy answer... for example, some say slotted tools are not as comfortable for them as finger rolling, and I know a needle tool enthusiast who has quilled with a corsage pin for decades without complaint. I use a needle tool for some projects, the Japanese slotted tool for others, and the standard slotted tool at times... in fact, both the needle tool and Japanese slotted tool were indispensable while making projects for the new book. Luckily, none of these tools are outrageously expensive and all should last a very long time when handled with respect. Perhaps give each one a try to determine your favorite. Missed you. I do not quill, but do work with paper as a creative outlet. Just last week, I was trying to roll flowers when my daughter loaned me her Klutz tool. I did notice the crimp when I started rolling and wondered if I was doing something wrong. Good to know that it is just part of the process with this sort of tool. Thank you for such an informative and inspiring blog. Wonderful info to have....thank you so much for the comparison! Glad you're back and happy to know a new book is forthcoming. 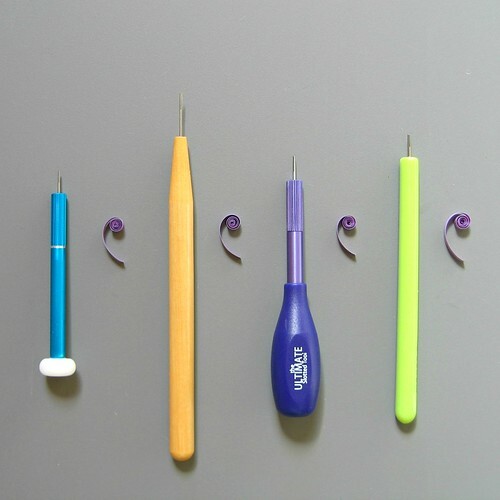 I also have and use the same four tools when quilling, including a handmade slotted tool made from a needle eye. One of those prongs broke off but I still use the other prong to roll narrow strips. Hi Anon, happy to have you here and thanks for your comment! Hi Jan, you are welcome! Thanks Gail! You sound just like me... making do even when something breaks. It's funny what works sometimes! Great post! I too have several quilling tools in my kit for different purposes. The Japanese tool is my daily favorite - I did break one while trying to make beehive coils, and won't be making that mistake again (and I also ordered a couple spares with my replacement - going for two weeks without my favorite tool was painful!). I'm glad you enjoyed the post, Fiona. It truly is a special tool. Hi Ann, I've just bought the Japanese slotted tool and I'm so happy you recommended it. It has made a big difference to how I quill and the outcome of the wool. I have my first table at a crafters fair coming up so I'm really pleased that your article came at the right time for me. Hi Lesley, I'm so glad to hear you like the tool (and Maggie) as much as I do! I hope your fair will be a big success. Thanks for the tips! I bought the Lake City tool once, but right out of the package the tongs were too close together to slide 1/8" paper into. When I tried "fixing" it with my fingernail, it promptly (and predictably) snapped. Been on the look out for an alternative ever since. I don't really sell my work--it's just a hobby--so I don't mind the crimp so much with my regular tool, but it'd be nice to have a smaller one. I tried using only the needle tool and I don't have the patience for it! The needle tool definitely requires more practice/patience, especially when first learning. I've never mastered finger rolling, but some love to quill that way. It's always interesting to hear what works for each person.